The Achilles’ heel of city planning has always been its inability to accurately foresee the needs of future communities. Most city plans take their final shape 10 to 50 years from the moment they are launched, a sufficiently long time span for the world to have become an entirely different place. Moreover, recent observations of area planning projects have revealed that no matter how creative or insightful the initial plan, standard planning generally results in communities lacking strong economic motors – insufficiently adaptable to changing conditions and often possessing only limited urban quality. A large area in the north of the Netherlands presented a unique opportunity for a radically new approach to city planning. A pilot project was run on this area with the growth planning method. A cooperative of various parties worked together to restructure an abandoned area with monumental buildings. Except continues to develop this revolutionary new planning method. Some of the fundamentals of the system are explained in this article. The core of traditional investment planning is to take a map of the area of interest and assign various programs to portions of the map. Housing, offices, commercial zones, services, and open space are regulated by the designer in a mix that is to result in the “ideal” neighborhood or city for a certain location. Whole libraries worth of books have been penned on the subject of what this exact mix should be and how its different elements should fit together. Using our new approach, however, we jettison the idea of a predetermined program entirely. Rather, we start with the pre-existing condition and apply planned socio-economic stimuli to the region in order to encourage investment and growth in the area. These stimuli can take almost any form other than the construction of physical structures. For example: festivals or gatherings, the creation of land co-ops, educational programs, etc. These stimuli are directed and managed over time to let the area grow and develop. While the stimuli are a planned component, the exact physical manifestation of the area is not. Individual initiative as well as corporate investment are both encouraged. A secondary essential component of this kind of planning is the establishment of strict performance standards and boundary constraints. For example, one such requirement adopted in the case of this project is that no energy be imported – in any form, which includes electricity – across the border of the development. These edge conditions are intended to push the area aggressively in the direction of sustainability, by requiring cutting edge and creative solutions from those who choose to develop in the area. Traditional planning requires enormous quantities of up-front investment from developers. Because these investments need to be paid off eventually, there’s a great deal of interest in controlling the eventual outcome of the planned area. It then does not matter if this outcome is sub-optimal, as long as the initial investment is re-captured along with a sufficient profit. Growth planning requires comparatively little up-front investment, thus curbing the desire for a pre-conditioned outcome. 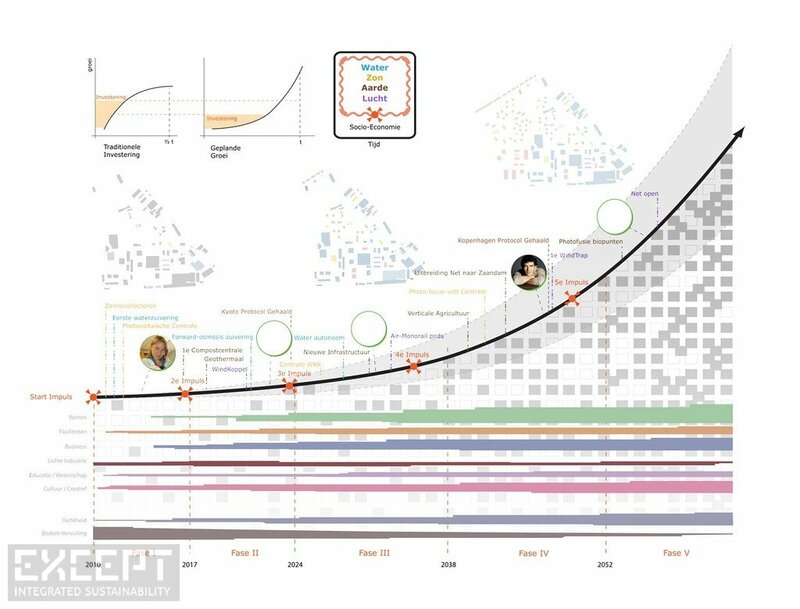 As time passes and the initiative takes off, the investment pattern follows an exponential curve, with various parties increasingly weighing in on the development. With very clear edge conditions set from the outset, the development will seek the ideal path to optimal growth within these conditions, with the mixture of program and functions to be determined by supply and demand as well as a desire for quality of the local agents. There’s no master plan, no drawings of what it will look like, just ideas about what it could look like. Using a performance-oriented approach to sustainability, monumental preservation, safety, and other concerns, a great number of unnecessary regulation can be discarded and an optimal localized solution cultivated. As mentioned, the development has a pre set condition forbidding energy from being imported onto the site (no fossil fuels, electricity, or otherwise). Another precondition is that no waste is allowed to leave the site. It does not matter what solutions are sought to these preconditions, or how the agents within the area resolve their needs for resources. As long as these conditions are met, the area will be an exemplary development. 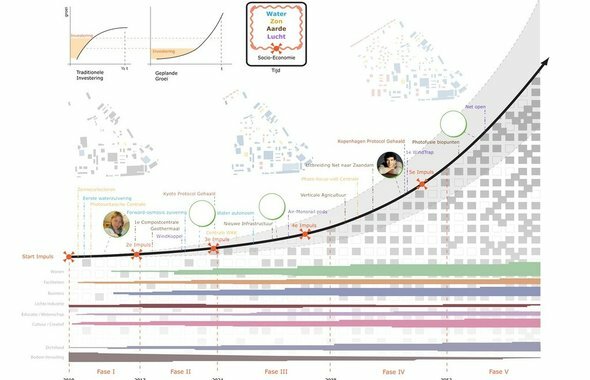 Because technology evolves much faster than rules and laws can keep up with, it is likely that a situation much closer to optimal sustainable development than seen in other planned areas will be able to flourish in the area. This we call performative planning, a component directly extracted from the Symbiosis in Development method. Various areas have been investigated for potential Growth Planning, ranging from existing urban sites to sites for new construction. A unique opportuntiy presented itself in the form of a secluded monumental parkland: a large site with several natural areas, as well as a great number of monuments that allow for interesting re-use. The soil was heavily polluted due to previous activity, and a large barrier around the site prevented business-as-usual planning. Something smarter needed to be done. The project took shape using a well-balanced system of area guidelines, a smart corporate structure for interested parties to join, and a beautiful setting that will be preserved and built upon. The area is projected to grow to metropolitan scale within 50 years, going through several stages of development. In its initial phase, pioneers will use the space for cultural, light industrial, and entertainment programs. In the second stage educational facilities will have developed a solid foothold in the park, and the beginnings of residential development, offices, and some retail will become apparent. Over time this will develop into a high-density area maintaining the natural resources on site, the monumental character of existing buildings, and cleaning up the pollution through the preservation and continued functioning of natural systems. Conceptual development and research of this system was done by Except, in addition to the texts, graphics, imagery, and graphic design of the main sections of the written report. For more information regarding second generation area development or Growth-Planning please contact us.